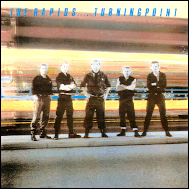 The Rapids were an Eighties Rockabilly band that moved into a sort of 'experimental' area of the music. There are elements of 'straight' Rockabilly, Eighties 'pop', stadium rock, psychobilly and what I like to think of as 'Eurobilly'. The Rapids took Rockabilly into areas that it had never been, and they did it with some VERY classy songs, too! This is the original Nervous LP (NERD019) plus tracks issued on a 12-inch single and a track recorded for 'Hell's bent on rockin' (NERCD017). Their vocalist (Lee Gocher a.k.a. J C Lee) has appeared in several bands since, and their lead guitarist (Spike), played briefly for Frenzy and the moved to Barcelona before coming back 'home' to England and thence to Germany. Their rhythm guitarist (Mark Rogerson) actually designed the Nervous Records logo.